When we get clear skies in London they can be truly beautiful. The sunset the other night was one of those evenings. 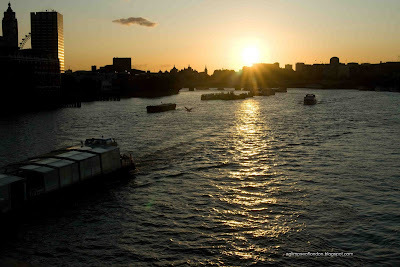 This view was taken from Black Friars Bridge looking towards Westminster. Visit other skywatchers around the world. That is a lovely sunset. I love the silhouette and look at how the suns race reflect on that building very nice! Hey, nice to meet a fellow Londoner! Beautiful sunset. Mo, the best thing that you did in this photo is not just the wonderful burst of colors but the position of the sun when you shot it! Though it is bidding so long, farewell, it's whole body is still in full view which gave the rays stunning effect! Love it! I can see the eye also! Vacation is on for me! So excited! Mabuhay and God bLess!! What a gorgeous view of the city... truly lovely! Awesome capture and a lovely view! I love the sunset...you have a beautiful photo, thanks for sharing! The viw over the water, could anything be more romantic at sunset. Nice pic. Very fine indeed, Mo! Excellent contribution to Sky Watch! Stunning shot, Mo. I love the way the ferris wheel is framed between the buildings. I love that the London Eye is visible between the two tall buildings. It adds a different shape to the photo. It interrupts the straight lines.